On the second floor of a building in downtown Lansing, state employees text individual teenagers, reminding them to buy textbooks and check their scholarship funds. A great use of taxpayer money. Wohlfert worked in financial aid at Western Michigan University and Oakland Community College before helping launch Mi Student Aid, a federally-funded, state-run effort to help get more low-income students into college. The program, now in its third year, helps guide students, particularly those from families where no one has attended college, through the maze of financial aid documents and college cost comparisons. Four workers travel the state giving seminars on financial aid. This week, they’re crisscrossing the Upper Peninsula, with 29 events scheduled around the state before Thanksgiving. You can see the schedule of meetings here. Those meetings are just the beginning of the office’s interaction with students, as officials try to reach teens where they live – on social media. “We can send letters, but students don’t read them,” Wohlfert said. 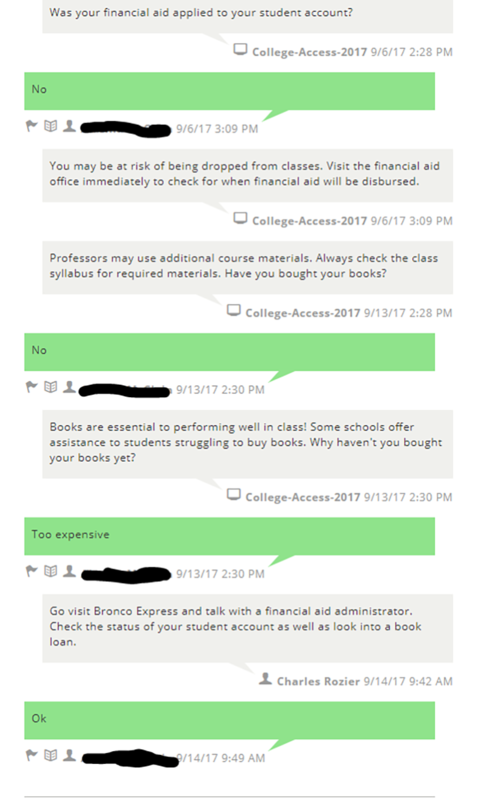 “So we’re on Facebook, Twitter, Instagram and Snapchat.” They even send personal text messages to students helping them find financial aid for textbooks for example. And of course there’s a rap video, starring Charles Rozier, who works in the Mi Student Aid office. Michigan has a lower percentage of adults with bachelor’s degrees (27 percent) than the national average (30 percent). Students from low-income families enroll in college at a lower rate (about 50 percent) than their wealthier classmates (about 70 percent). Low-income students often assume they can’t afford college, Wohlfert said. It’s an assumption not helped by Michigan’s low level of state-funded scholarships. That’s tough to do for students from families that don’t know how college costs work. It’s too early to tell whether the program is helping. The most recent data showing the college-going rates of high school students is from the first year of the Mi Student Aid effort. Mi Student Aid gets its funding from the federal government. It costs “under a million dollars” a year, Wohlfert said, and “we’re starting to make a dent, but there is so much we need to do. We could do more with more (funding).